The Charleston is a dance, which was became popular in the 1920s. It is named after the city of Charleston, South Carolina. A song called The Charleston, composed in 1923 made it popular. This song was part of the Broadway musical Running Wild. 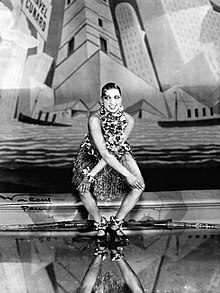 In Europe, Josephine Baker made the Charleston popular, starting in 1925. Charleston is associated with Flappers who danced it in Speakeasy bars, to mock themselves about the prohibition of alcohol, which was in force in the US, in the 1920s. For this reason, dancing Charleston was seen as provocative. This page was last changed on 16 April 2018, at 19:53.